A spectacular day on the Santa Monica Pier filled with exciting activities, fun rides, and some of our favorite celebrities all while benefitting a phenomenal cause – sign us up! Every year, we all always look forward to one of the greatest and most inspiring events – the Mattel Party on the Pier. The wonderful Mattel Party on the Pier has always been and continues to be such a special day for everyone – from the attendees to the celebrities who show their support to the awesome event and all of the patients at the Mattel Children’s Hospital UCLA. The event brings about a lot of happiness and puts smiles on everyone’s face and is a terrific event for families to attend to benefit the Mattel Children’s Hospital UCLA. The Mattel Party on the Pier made its way back to Pacific Park on the Santa Monica Pier for a sunny day today, September 25, 2016. The sensational event had a lot of excitement including a Kids’ Fun Lounge which included glitter tattoos and face-painting by Sketchers, a cookie decorating station hosted by Ralphs (sounds yummy!) and a Wall of Hope sponsored by the Los Angeles Dodgers. All attendees had the opportunity to write heart-warming messages to honor the incredible patients at the Children’s Hospital. The event always spreads an immense amount of positive vibes and hope to everyone and it is so great to see so many people come out to show their support towards such a marvelous event. The event even included unlimited rides and carnival games with prizes from Mattel. Many celebrities came out to show their support at the event including Rio Mangini, Cree Cicchino, Lance Lim, Olivia Stuck, Jenna Ortega, Jacob Hopkins, Tiffany Espensen, Kayla Maisonet, Landry Bender, Jet Jurgensmeyer, Cade Sutton, Dante Brown, Jaheem Toombs, Raini and Rico Rodriguez, August Maturo, Isaak Presley, Jack Griffo, Tammin Sursok, LA Dodgers players, and many more. These celebrities had a fantastic time using their platform for good and inspiring others to do the same. They had an excellent time volunteering at many of the exceptional activities at the event including the selfie booth, ring toss area, and more. This year, the Mattel Party on the Pier is giving people the opportunity to text to donate. You can show your support and help make a difference by texting Mattel POP16 to 24700 to help fund new discoveries and help the children at the Mattel Children’s Hospital UCLA. Without a doubt, the Mattel Party on the Pier is a fantastic event for families and friends to attend together. The event creates such a marvelous and awe-inspiring atmosphere and a day that will truly fill your heart with so much love and joy. The Mattel Party on the Pier event is definitely one of my favorite events and it is an event you all should mark down on your calendars to attend yearly for an extraordinary day. I, Alexisjoyvipaccess had the greatest honor of covering the Mattel Party on the Pier for the third year in a row today. Check out some VIPAccessEXCLUSIVE pictures from my coverage of the event and stay tuned for VIPAccessEXCLUSIVE interviews with Cree Cicchino, Rio Mangini, Jenna Ortega, Lance Lim, Olivia Stuck, Jacob Hopkins, Jaheem Toombs, Landry Bender, Tiffany Espensen, Dante Brown, Kayla Maisonet, Jet Jurgensmeyer, and Cade Sutton on YouTube.com/alexisjoyvipaccess! Follow @MCHUCLA and join in on the conversation by using #MattelPOP on all social media networks! 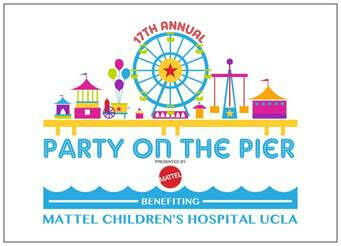 Follow the Mattel Party on the Pier on Facebook and visit here for more info on the event and here for more info on the Mattel Children’s Hospital UCLA. Previous Article: Olivia Holt Looked So Ravishing At The Teen Vogue Young Hollywood Party! Next Article: Isabela Moner Rocked An Awesome, New Eye Color And Looked Stunning At The Teen Vogue Young Hollywood Party!